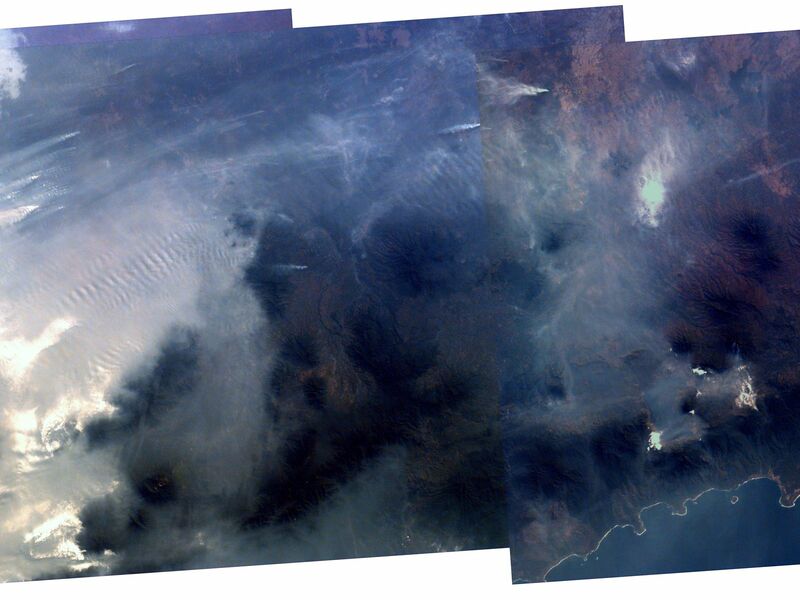 Middle school students across the country photographed the fires and smoke over southern Sumatra from a camera aboard the Space Shuttle Atlantis September 27. A joint effort between 23 of the 52 schools participating in this mission, the KidSat camera was used to image a 140 km wide, 1950 km long strip that starts in the northwest (5.24 degrees N, 97.11 degrees E), and follows the Pegunungan Barisan range across the equator to the southern tip of Sumatra 7.44S, 106.1E [MET 00215343 - 00215750]. Smoldering underground fires have raged uncontrolled for the past few weeks in Southeast Asia. Originally set to clear land for agriculture, the fires are usually extinguished by the annual monsoon rains. However, this year, the rains had not come due to El NiÃ±o which produces dry conditions in the Indonesia region. Due to the lack of trade winds, the seasonal warm waters in the eastern Pacific have spread over to South America. Consequently, the water temperature in Indonesia has dropped significantly. This decrease in temperature has not produced enough warm water vapor to produce the normal seasonal showers that usually encompass the area. The fire has now been blamed for two fatal accidents and countless health hazards. At one point, the pollution index of the region reached 839. To put a relative point to this number, a pollution index of 300 is a equivalent of smoking 20 cigarettes a day. The smoke, during one time, blanketed an area that was larger than the continental United States. Currently, the fire's rage has been quelled by winds and rain which have lifted the smog and dampened the fires. However it is estimated that 100,000 fire fighters are needed to stop the fire. The KidSat image shown here is a mosaic of three images of the 16 image series (Mission Elapsed Time) 00215624, 00215637, 00215701; the center latitude and longitude of each image, respectively, is 3.0 degrees S 102.9 degrees E, 3.7 degrees S 103.4 degrees E, 4.9 degrees S 104.3 degrees E and is 140 km wide and 400 km long. The images were captured on September 27, 1997 during Shuttle flight STS-86. Starting in the south (right) and traveling northwest (left), a clear view is visible of the southern tip of Sumatra with the volcanoes that make up the backbone of the island appearing darker than the surrounding land. 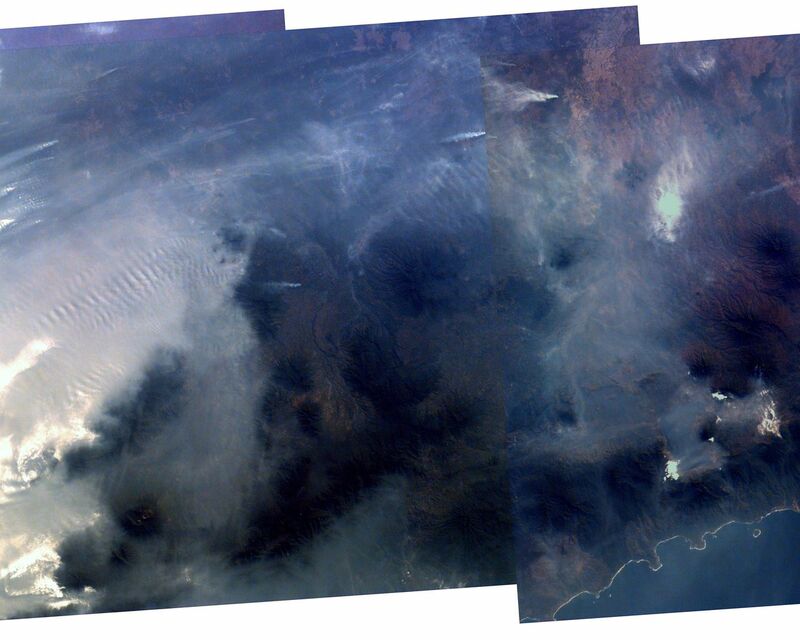 Further northwest, the first smoke plumes appear in the rain forests east of the mountains where land is being cleared for palm plantations; the plumes indicate a prevailing wind to the northwest. 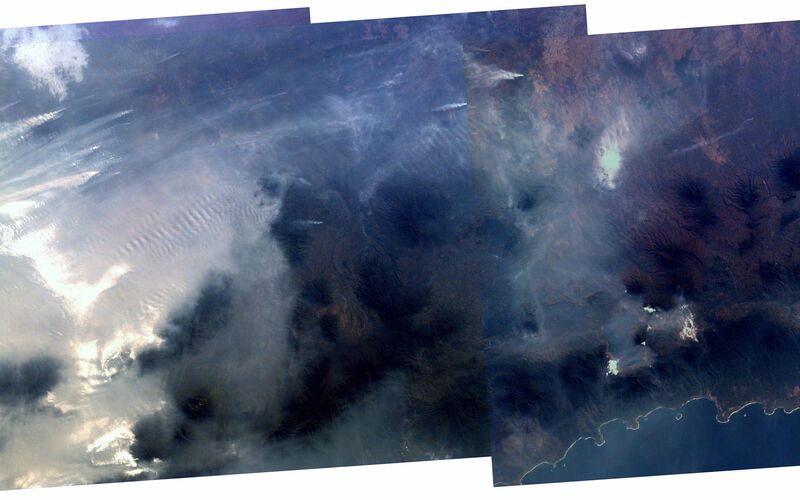 Within a short distance, the region becomes completely blanketed in smoke with only the peaks of the volcanoes rising above the gray haze layer. The KidSat camera that photographed these fires is mounted in the overhead starboard window of the Shuttle Atlantis and operates before and after docking with Mir when the Shuttle's windows face the Earth. Students on the ground are linked to the camera through the Internet and a series of satellites. High school and undergraduate students work in collaboration with scientists and engineers to develop and operate the KidSat systems. Curriculum developed by The Johns Hopkins University Institute for the Academic Advancement of Youth is used in the middle school classrooms to encourage scientific inquiry based on the images. The KidSat program was developed by the Jet Propulsion Laboratory, The Johns Hopkins University Institute for the Academic Advancement of Youth, and The University of California, San Diego, with support from NASA's Johnson Space Center. The project is supported by NASA's Office of Human Resources and Education with support from NASA's Offices of Mission to Planet Earth, Space Flight, and Space Science. JPL is a division of the California Institute of Technology (Caltech). The website formerly known as KidSat was renamed EarthKAM in 1998: http://www.earthkam.ucsd.edu/.